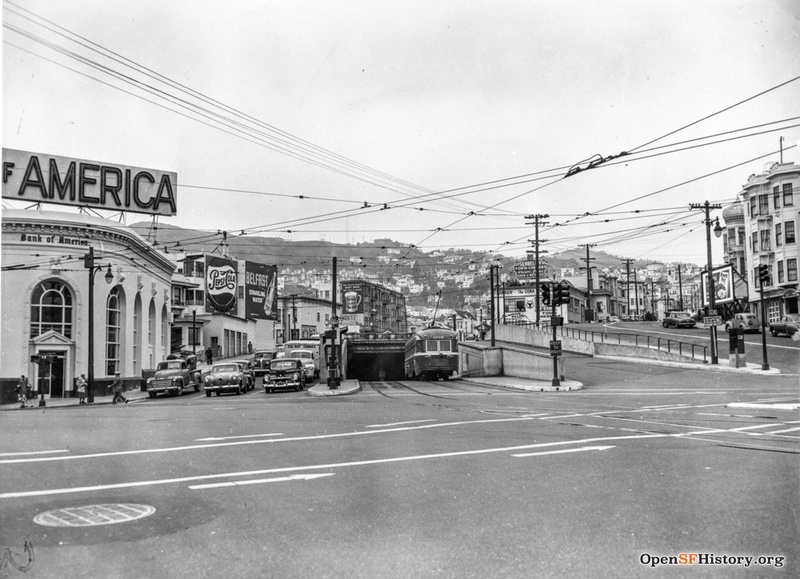 The intersection of Castro & Market Streets has undergone transformations over the course of history (photo gallery below). 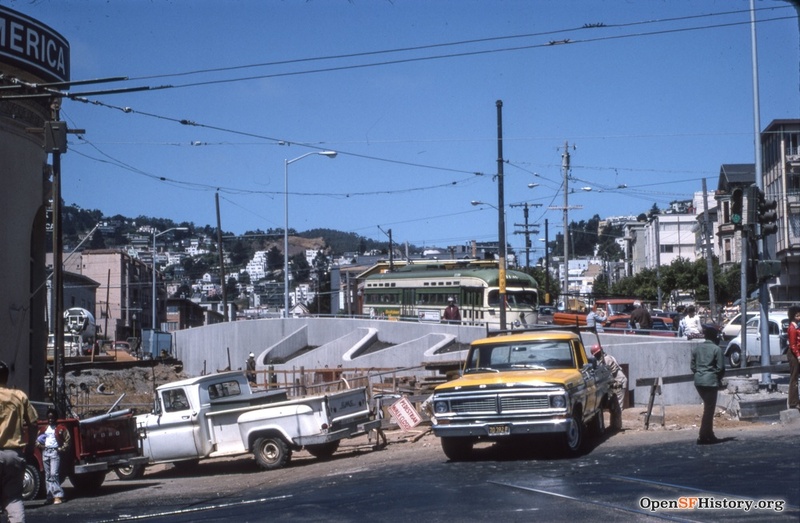 When the seven subterranean Muni Metro stations debuted in May 1980, there was a grand celebration for the Castro station called “Metro Madness, Dancing under the streets”. On September 15, 1985, Mayor Dianne Feinstein, Board of Supervisors President John L. Molinari and Harvey’s successor, Supervisor Harry Britt dedicated Harvey Milk Plaza. Previously the name was Castro Station and Plaza. Informally known as the “Mayor of Castro Street”, Harvey Milk was omnipresent in the Castro once he opened Castro Camera at 575 Castro Street in 1973. 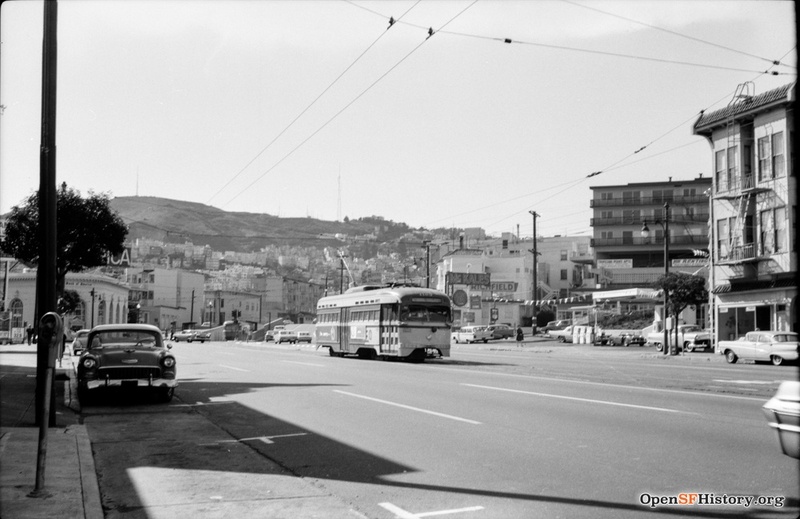 The corner of Castro & Market streets became the defacto gathering place where rallies, meetings, homage, inspiration, hope and dreams coalesce even today. Harvey Milk Plaza was bestowed upon this sacred ground in tribute to the man who altered the course of the LGBT movement. On November 8, 1997, the 20th anniversary of Harvey Milk being elected to the San Francisco Board of Supervisors, the iconic oversized rainbow flag was raised in Harvey Milk Plaza. This art installation was a joint effort by the Castro Merchants, Gilbert Baker and others to appropriately commemorate the anniversary. The flag pole used in the art installation originally stood in UN Plaza without great purpose until it was relocated to its current location on the corner of Castro & Market streets. On November 8, 2017, the 40th anniversary of Harvey Milk being elected to the San Francisco Board of Supervisors, the illuminated neon sign “Hope Will Never Be Silent” debuted on the façade below the cornice on the building located adjacent to Harvey Milk Plaza. Initiated by The Friends of Harvey Milk Plaza and conceived by Ben Davis, the illuminated sign is a permanent greeting to all who call Castro home, be they San Francisco residents or visitors from around the world. The significance of this phrase dates back to June 24, 1977, when Harvey Milk stood in front of a gathering of people and announced his candidacy for the San Francisco Board of Supervisors. He eloquently shared a profound philosophy of his transcendent view on wide range of relevant topics, one closest to his heart, hope. This precise moment would be one of his finest and perhaps his most notable, it would come to be referenced as the “Hope Speech”. Hope was a concept core to Harvey Milk, woven throughout his world view. He spoke about it often, according to some, like Gwenn Craig, seldom a day went by when Harvey didn’t talk about hope. “Hope will never be silent” emblazon on the building at the corner of Castro & Market streets is timeless and purposeful and serves as a call to action to honor Harvey Milk at the plaza that bears his name. San Francisco is a densely populated urban core with continual population, housing and job growth anticipated. The Castro is centrally located, adjacent to the hub of job and housing growth. In addition, the Castro lies on the perimeter of the corridor prioritized by Better Market Street, intended to deliver transformative transportation, streetscape and safety improvements along 2.2 miles of Market Street from Octavia to Embarcadero. The improvements will connect the city’s Civic Center and Transbay Terminal with businesses, jobs, neighborhoods, culture, tourism, and retail. As SF City Planning, SFMTA, BART and other agencies work to respond to anticipated growth, it is also incumbent upon the local residents, CBDs, community interest organizations and others to participate in the changing landscape to advocate for the best possible solutions in our community. When the Castro Muni Metro Station began service in 1980, the population of San Francisco was 678,974 compared to a 2016 estimate of 870,887. It is projected that by 2040, San Francisco population will grow to nearly one million residents, a 34% increase. Plan Bay Area predicts that San Francisco alone will add 126,000 jobs and 95,000 homes between 2015 and 2040. Much of this is already occurring – projects to create housing for up to 60,000 new people are currently under review or in construction. Reimagining Harvey Milk Plaza at this pivotal moment provides the opportunity to make modifications essential to ease mobility and accommodate increased capacity as a transit hub, as well as improve its function as a community gathering space of historical and cultural significance.